Step 4. Scroll down to the page you wish to remove. Step 5. Click the "Remove Page" button under the Pages tab in the PDF Converter toolbar. Step 6. Confirm the removal of the page. You may find that you have a huge PDF file with hundreds of pages. What if you don't need some of those pages? 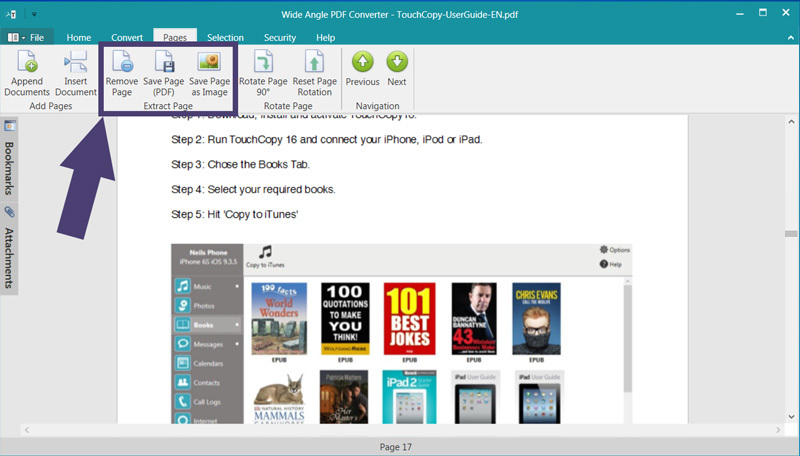 PDF Converter lets you remove these pages from your PDF file, keeping the file-size small if you are to need to share the file via email, or if the recipient does not need certain pages. To delete pages from PDF, scroll down to the page that you wish to remove from the file, and click Remove Page from the Pages tab of the toolbar. Check that the correct page is being removed from the confirmation message, then click Remove Page to confirm the removal. How to extract pages from PDF >.